Denpasar’s Ngurah Rai Airport is undergoing some major movement and with the new completion of the international terminal, domestic departures for Garuda Indonesia is conducted at the ground floor of the international terminal. There was no queue during check-in as I was a Gold member in Garuda’s Frequent Flyer. Check-in was efficient, though I had forgotten to request for an aisle seat and there was no questions asked by the agent either. Perhaps it is because of the new terminal, but they were boarding the plane by bus and it has already begun boarding when I arrived at the gate. There were 2 queues for the boarding pass check and it helped in moving the line forward. And usually I enjoy boarding a widebody by the stairs but this particular A330 was parked beside an aerobridge, and it just makes you wonder why they cannot just board passengers through the aerobridge instead. The bus that is used in Indonesia is also very backward with stairs and makes it difficult for passengers to go up and down the bus. For that it loses points as boarding by bus is not the most comfortable in many Indonesian airports and Garuda Indonesia seems to do this often. 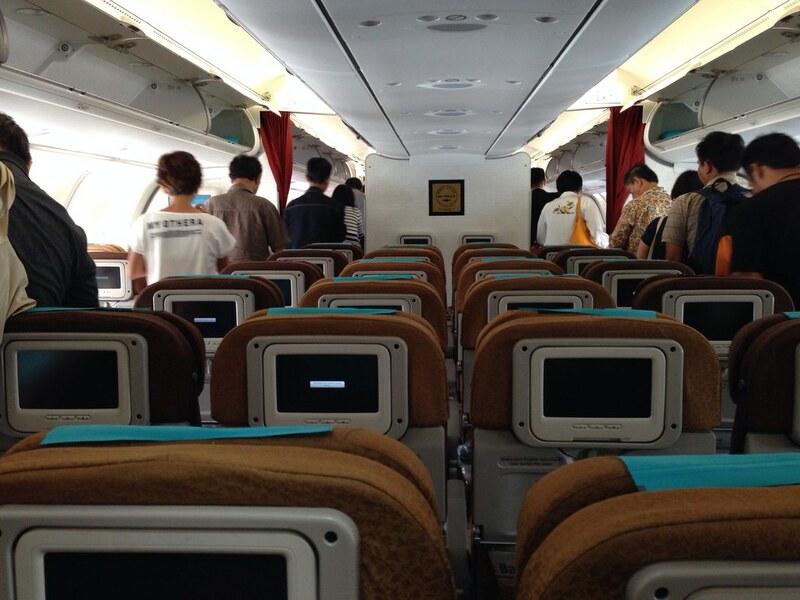 The seats onboard Garuda’s Airbus A330 are more or less similar to that on their new 737-800s. The seat is upholstered in a very nice earthy brown and has adequate padding. However the seat has no leg rest which is a negative especially since the A330s are meant to be used in many mid-haul regional routes such as to Melbourne, Perth, Seoul and Osaka. Seat pitch was average and seems to be similar to other airlines. 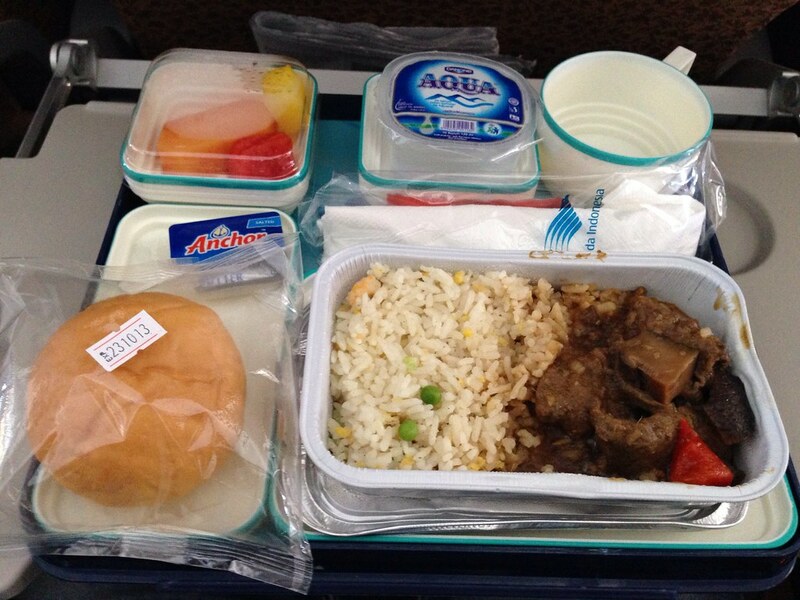 Amongst the domestic flight service in Indonesia, the ones between Denpasar (Bali) and Jakarta is one of the more generous with a full meal service. The flight between Jakarta and Surabaya just includes a snack box which is quite poor in my opinion since the flights are nearly the same in terms of flight duration. Quality of food is also where Garuda loses in my opinion since the taste of the food are usually terrible. In this flight, they still did have 2 options when the crew served me and I went with the beef option which comes with rice. The beef was too tough for my taste while the rice was at least not too bad. However after numerous times flying with them, I have rarely had a decent meal and for that I rate them low on this factor. The redeeming part is that the meal trays look substantial and presentation is at least good. Garuda also includes a pack of refreshing tissues for passengers in every meal tray so that is another plus point. Garuda uses touch-screen systems in all of its new fleet though they still have a couple of planes that does not have any seat-back monitors in economy class. The A330s personal entertainment system is similar to that of the 737s. The content was also disappointingly similar. I would say they are alright for a flight of between 1-2 hours since they do have some movies. However these movies are usually some forgotten movies from the theatres and a couple of Asian movies. Their range of TV shows and other videos are very limited and not worth considering. While there is generally no big issue on the touch screen, they are still a chore to use compared to the remote controlled version. Generally passable entertainment but not exactly optimum for mid-haul daytime flights. Garuda has very good cabin crews and most of them I have encountered are generally friendly. However their flight attendants does not seem keen at all in helping passengers with their luggage during the boarding process. Instead they are mere wallflowers. However they are usually dressed neatly and speaks English well to a certain extent. Another observation is how they serve passengers with candies after boarding in economy class. Flights between Singapore and Jakarta also includes a welcome drink of orange juice before take-off. Generally service is good by crew members but there is a lack of effort put in by cabin crew in offering beverages or ensuring a clean cabin prior to landing. 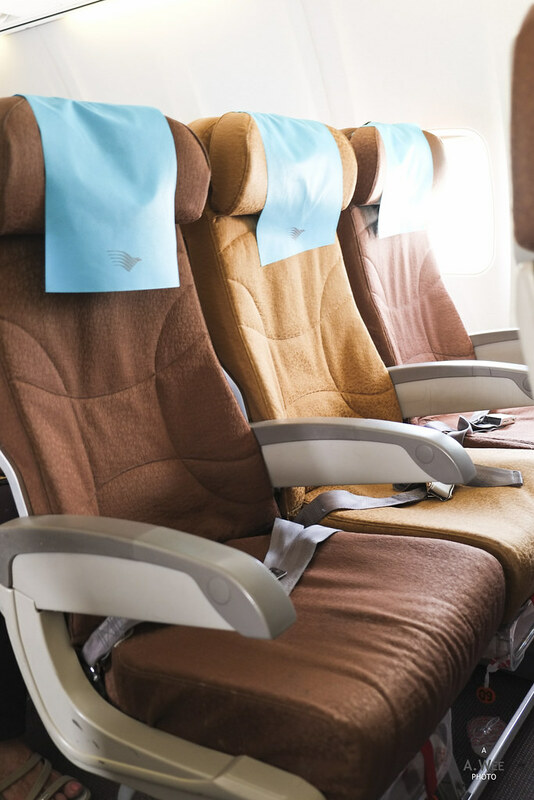 In economy class, the cabin is clean and generally well maintained. During boarding and disembarking, the airline music is played and it generally provides a calm atmosphere. 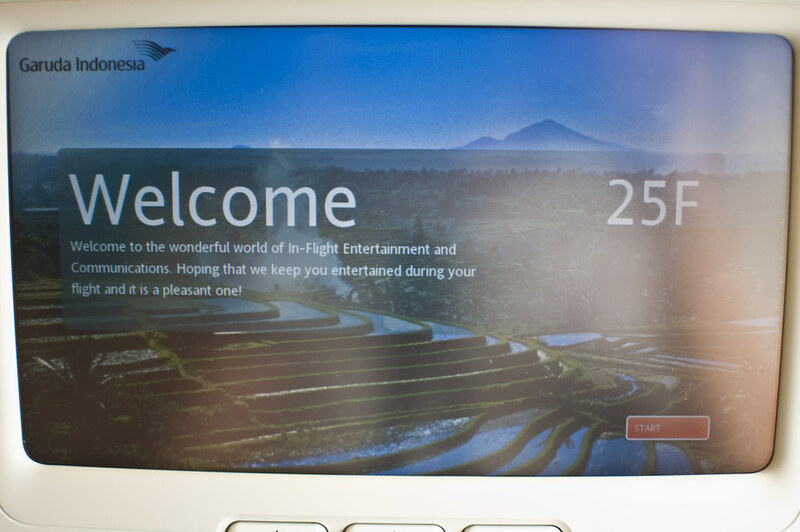 Generally it is a pleasant experience most of the time flying onboard Garuda Indonesia. Garuda Indonesia provides a decent flying experience with a new fleet, a consistent branding and some good crew members. However the airline has some ground to cover in terms of catering, and improving ground handling experience.